Transform your ordinary salad into a burst of flavours with this quick and healthy grilled nectarine & lentil salad. 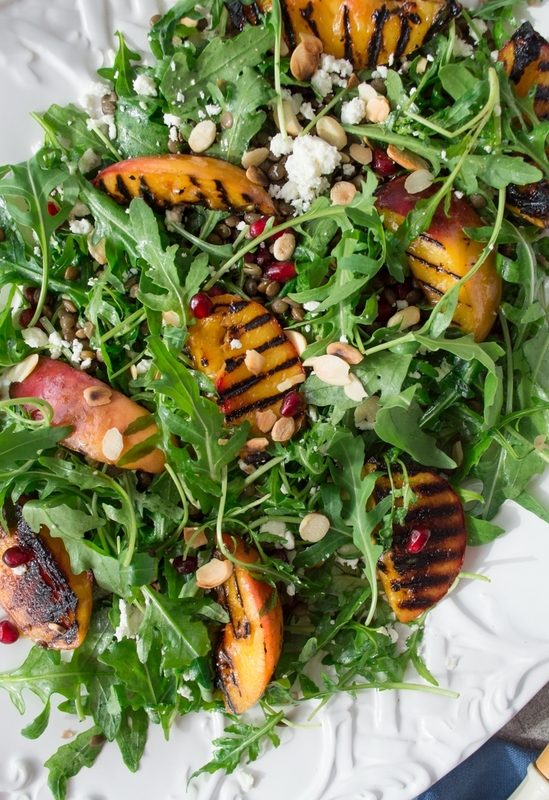 Sweet smokiness from grilled nectarines combined with peppery rocket (arugula), slightly salty feta and crunchy toasted almond flakes will make this salad a winning number for lunch or dinner. Vegetarian & gluten free. I’m writing this blog post still on a high from the weekend in London after attending the Health Blog Awards ceremony organised by the Health Bloggers Community. I never imagined, even for a second, that my little blog would win the ‘Best Recipe Blog’ category… What an absolute honour! I feel so humbled and so grateful to every single one of you who rooted for me. Thank you from the bottom of my grateful heart. This award has proved to be that little push that I needed to take my Fit Foodie Nutter business to a new level. I’ve had so many ideas bubbling away for ages but if I’m truthful, I was too scared to put them out there into the big wide world. As they say though, ‘if you always do what you’ve always done then you will always get what you always got’. So, watch this space – there will be some exciting announcements coming your way soon! 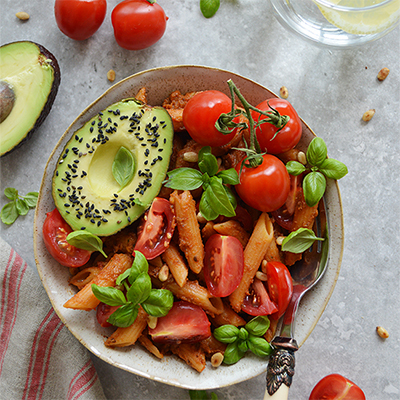 Now let’s move onto this simple yet mind-blowingly delicious salad. 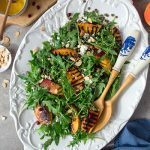 Smokey grilled nectarines transform this dish from a plain meal to a vibrant dish bursting with flavours. 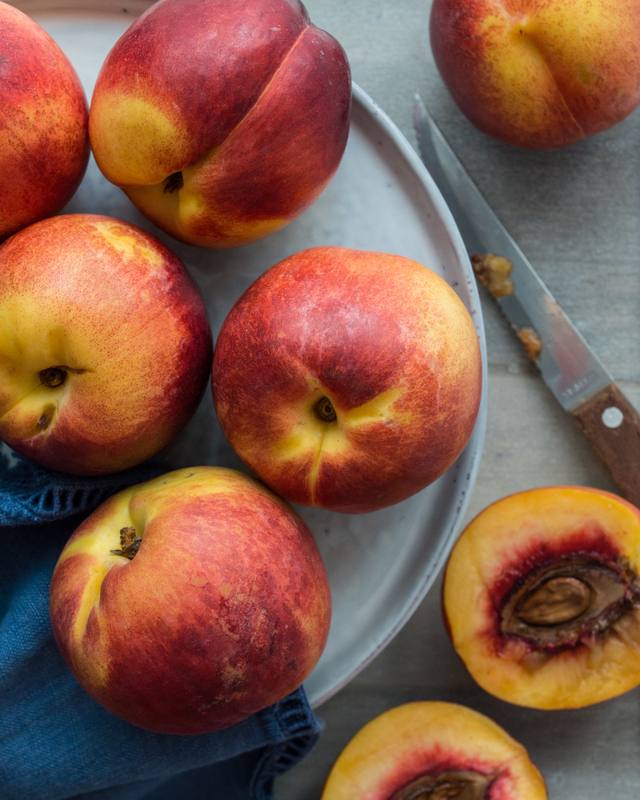 You can by all means use peaches instead of nectarines but I personally prefer smooth-skinned nectarines to the peaches with rough skin. It’s just a matter of personal choice. The addition of slightly salty feta, peppery ricotta and crunchy toasted almond flakes take this salad to another level, I promise. You can by all means leave out feta (or replace it with dairy free option) to make this salad vegan friendly. To save time to prepare quick and healthy salads like this one, I either cook a big batch of lentils and keep them in the fridge to add to my meals as I go along (they’re a great source of plant protein) or I use already cooked lentils (Merchant Gourmet is my favourite). Anything to save time when you’re hungry and impatient! On this note, let me share the recipe with you right now. As always, you would make my day by leaving a comment on my blog. Thank you very much my friend. 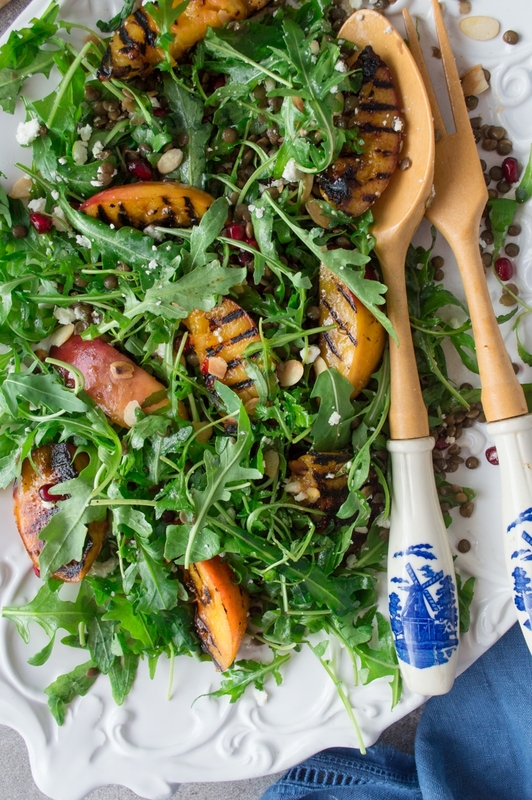 Transform your ordinary salad into a burst of flavours with this quick and healthy grilled nectarine & lentil salad. 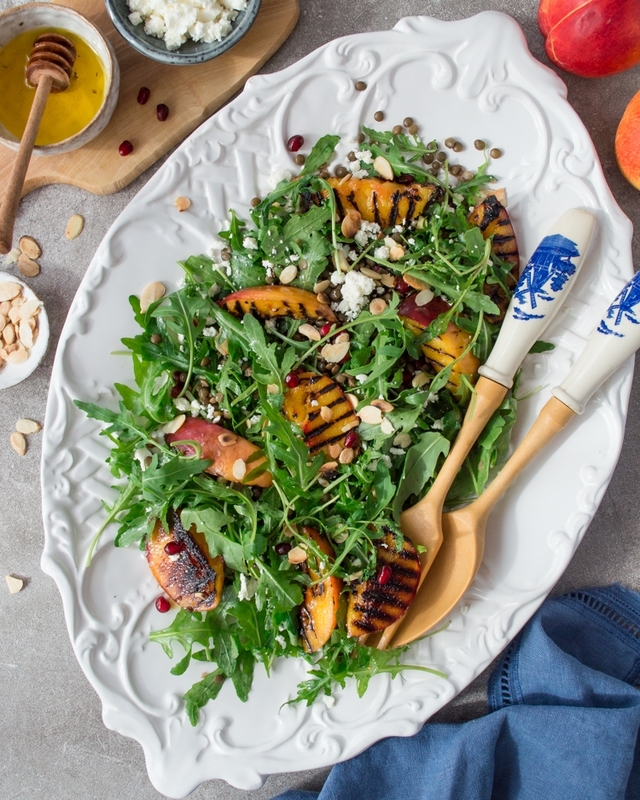 Sweet smokiness from grilled nectarines combined with peppery rocket, slightly salty feta and crunchy toasted almond flakes will make this salad a winning number for lunch or dinner. Vegetarian & gluten free. 1. Heat up 1 tbsp olive oil in a hot grill pan. Place the nectarines (flesh side down) in a pan and grill for 30-60 seconds on each side. Pour 1 tbsp maple syrup over the nectarines and toss the nectarines over the pan. Cook for a further 1-2 minutes until slightly caramelised. Set aside. 2. In a salad bowl, combine lentils, rocket and feta and mix well. 3. To toast almond flakes, heat up a non-stick pan. Add the almond flakes into the dry pan and keep tossing until golden brown (1-2 minutes). Set aside. 4. To make a dressing, combine olive oil and lemon juice and whisk well. Slowly add the maple syrup until you reach the right balance between sweet & sour (2-3 tsp). 5. Add the grilled nectarines into the salad bowl. Pour the dressing over the salad (you might not use all of it, so add a little at a time) and mix well. Sprinkle with toasted almond flakes and pomegranate seeds and serve immediately. Congrats on winning the best recipe blog! What an honor!! I can see why you won though, this salad looks delicious, but I love that it is also healthy. I love salads with lot of toppings! Makes things so much more interesting. And P.S. I LOVE those cute little salad tongs. this is totally my kind of salad!!! the char on those nectarines looks so so yum! Thank you so much Georgie! 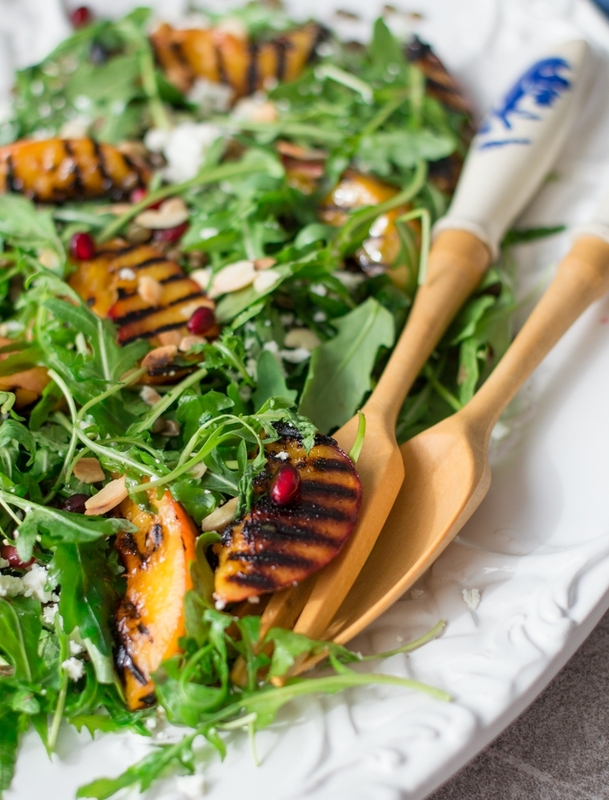 The char on those nectarines definitely makes all the difference and adds so much flavour to this humble salad! I just adore lentils and arugula together in salads. I can’t wait to try your recipe with grilled nectarines! This salad looks refreshing. I love the idea of making lentils and storing it. Having cooked lentils handy will encourage me to have them more often. 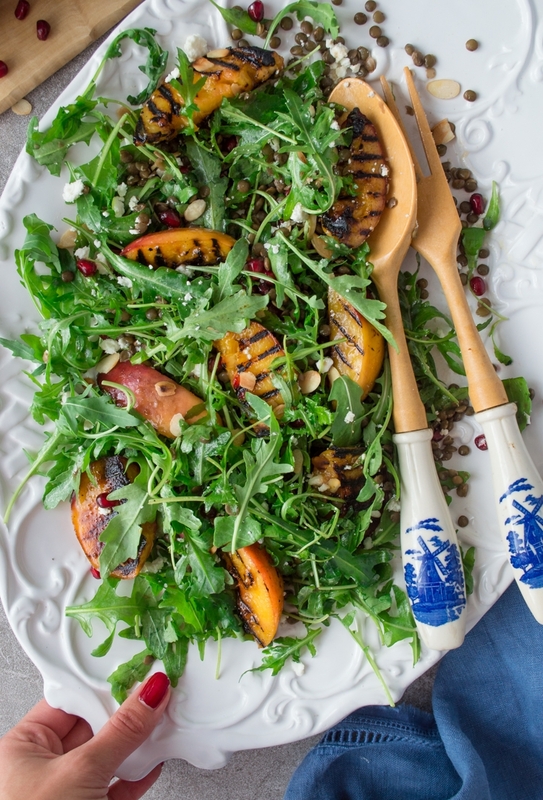 I love grilled nectarines and they work so well in salad but hadn’t thought to combine them with lentils. But I can see the sweet-savory really working. Yum!